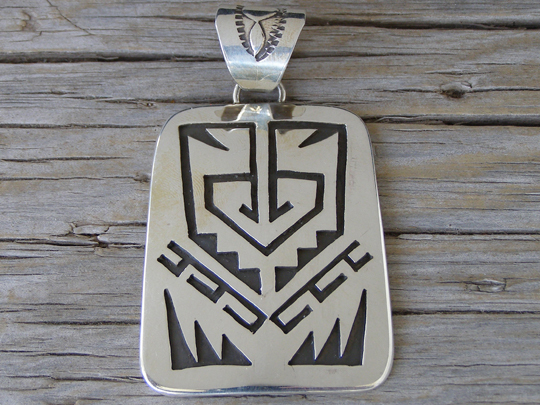 Renowned for his Walking Bear design in both bracelets and belt buckles, Navajo silverrsmith Rosco Scott now makes pendants using his fine overlay technique, which is reminiscent of Hopi silverwork. This pendant shows stylized geometric designs. The bale is made to accommodate beads of up to 10 mm. diameter. Hallmarked ROSCO SCOTT and stamped Sterling on back. Dimensions of pendant (excluding bale & jump ring): 2" x 1 9/16"